I think a roasted potato is one of the most delicious things in the world. Add in a hearty portion of flavourful tofu and the zing of lemons and you have yourself a wonderful winter meal. How much of each ingredient you use is really up to you and the size of your baking dish. Drizzle some gravy over it all if that is your thing, and dig out that applesauce you made in the fall. 1. When the tofu is done brining, heat a frying pan over med-hi heat. Add margarine and sear the tofu pieces on all sides. Do this in two batches, with more margarine, if necessary. 2. Place the pieces of tofu in a baking dish (I use a 8.5x11 cast iron one) with space in between. Drizzle the frying margarine over top. Place springs of fresh oregano and chopped garlic in between the pieces of tofu. 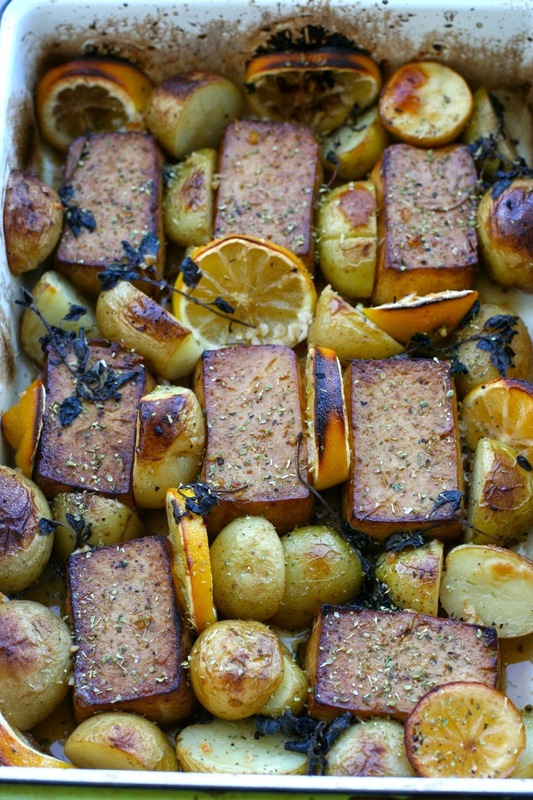 Add the lemon slices and enough potato chunks to fill in the spaces. Don't make things too crowded, but they can be a bit snug. Grind fresh pepper over the whole lot. 3. Add 1 cup of veggie stock to the pan and place in the oven, uncovered. After the first 20 mins, baste about every 10 mins. If the stock dries up too quickly, add more in as needed. You don't want a cup of liquid left over at the end--you want just enough to keep everything moist. If your potatoes are browning too quickly you can reduce the heat to 425. Everything should be nicely roasted after an hour.